I can't recommend this toy enough. All three of my school age children love this and because it's such an open ended toy it suits a range of ages. My eldest has additional needs and still found so many of the games fun and easy to do and my 5yr old has so much fun that I think he forgot he was actually doing maths. I love games like this where my children get to experience learning as a fun filled activity. 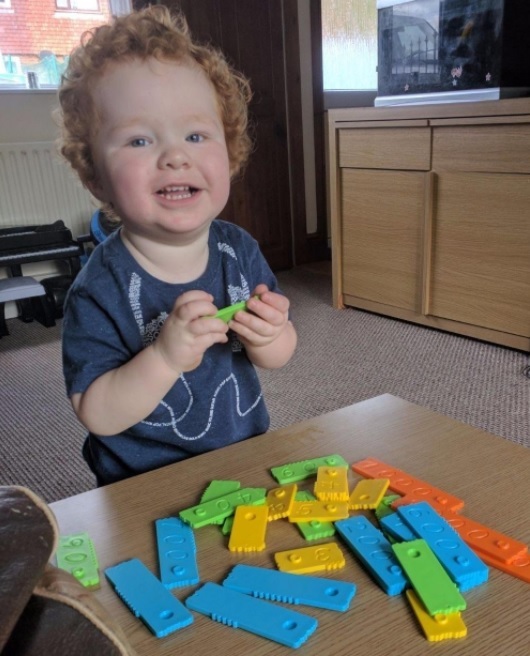 I got these for our young son, and as you can see from the photographs he absolutely loves them, they are very brightly coloured and very robust, they make learning fun, and he hardly realises he's learning, he just thinks he's playing a game. Its an excellent buy, definitely recommend this for anyone with pre school age children. Even his older sister enjoys playing games with them when he puts them down. I can't stress enough how brilliant newmero bricks are my son is 9 years old but has aspergers and dyspraxia among many other issues so he really struggles with his learning he enjoyed using these bricks and sat for over an hour keen to do more (learn more) they were amazing he doesnt take to anything usually!! They were also amazing for my 7 year old who struggles with mathematics in school and doesn't really enjoy it much but i can't believe how much using newmero brick have not only improved her ability but her attitude to learning maths she much more motivated would highly recommend they are amazing and have worked wonders with my 2 kids will be definitely continuing to use these!! Thank you so much. These are an amazing educational resource, so versatile and can be used to aid all sorts of maths learning and have been pretty much used everyday since we got them. They come with a book of ideas and games for learning and how to use them but they is also more information available and videos on things they can be used for. I'm really impressed with them and think they are money well spent that will help in so many ways. These are amazing, my daughter really does struggle with her maths and these really help her to get fast with her simple maths which is what she struggles with... they are brilliant and are sooo much fun, they both love this. Even the adults love to play. Would defo recommend this to the whole family, it's really great. Wow wow wow what an excellent way to teach kids I use this with my son he is 2 years old and now can count to 20 impressive played a game recommended by the seller as find the fish seller also give more good advice as what to play overall excellent. A fantastic piece of kit for early maths. With my teacher hat on, I wish I had this in my classroom earlier. I have used the traditional rods and cubes and the newer plastic pieces with finger holes and this new design seems to combine the best bits of both and adds more. With my parent hat on, I am pleased to have a useful maths aid for my children to use as they like at home, and they do! The pieces are very robust and well made. Each piece features a digit (with a straight 9 and a curly 6), the corresponding number of bumps at the top and a key shaped pattern on the side. SO tactile. Different colour pieces represent units, tens, hundreds and thousands and they are stackable making them perfect to illustrate place value. The key shaped sides fit together for number bonds to 10, 100 and 1000 and the bumps at the top are countable and physically demonstrate the amount that the number represents. So far my 5 year old has happily played games involving which number is the largest, checking number bonds to 10 or 100, creating and comparing 2-digit numbers, creating repeating patterns, sorting sets of numbers and counting in 1s, 2s and 3s. With older children I would use them to consolidate understanding of 3-digit place value and decomposition, and using the blocks for addition and subtraction. On the other end of the scale my 1 year old has even used them to practice sorting colours. I’d recommend these to parents and schools for children aged 3-9. Brilliant idea!! Whoever thought about this method of teaching kids how to learn numbers and how to calculate them is a very smart person. My 4 year old loves this very much, which is very surprising for me to see him do math and understand it! My 8 year old also find pleasure in playing and learning from this game. Very happy with this purchase. These newmero bricks are amazing at first I tested them out with my 3 year old counting to 10 then I took them into class to my students who then counted their times tables with the help of placing the numero bricks on top of each other using the different colours. These are brilliant to help out the students with maths and I would recommend as a resource to all teachers if not just to use with children at home. 1. It is very well designed and built. Rock solid quality. 2. It can be used for kids from 3 to 9. I was a little bit skeptical at first, to be honest, that something can be used for a 3-year-old as well as a 9-year-old. But this thing is designed in such a genius way that it can teach kids from recognizing numbers, to counting, all the way up to adding 4-digit to 4-digit numbers. 4. I love the friends of 10s, 100s, and 1000s concepts. These concepts are the foundations for mental math and calculation, and I can lay that foundation with my kids through playing. They will have such much easier time when it comes to doing the more complicated mental math later. 5. It also came with very beautiful and sturdy carrying bag so all pieces can stay together. 6. There are so many games you can play with this set. Did I mention they actually have a bunch of videos to show you how to do some of the games on their website? Being a visual learner myself, that is such a huge plus to me. So far I can not see a thing I do not like about these bricks. I can see years of education and fun to come. Just received our blocks and my daughter loves them, they make make the learning fun for her and help to remember the groupings of numbers. The blocks fit together like a puzzle for sets of numbers that equal 10...100....its definitely a very creative way for children to learn. The seller was easy to work with and the product is of a high quality. The blocks come with an instruction booklet that makes it easy to understand, as well as with a trendy little carrying bag. Bought it for my daughter. This game help her understand the numbers. It's a good bonding between me and my daughter. She loves numbers and she loves bricks. It's easy to understand the game since the manual explain it very well. This bricks also help my daughter understand the additions and subtraction. I also downloaded the big manual and can't wait to try more games and exercises on there. I love that she is not stress about it. It's like we're just playing but at the same time she is learning. These newmero bricks are just fantastic. My son loves them. They are not only very beautiful and colorful, they are also very useful because they make it easy for the child to enter the world of numbers. My son is 4 years old and has a lot of fun. The set comes with a storage pouch, and a tutorial with explanation and sample games. Recommend this product to every kid. These blocks are just wonderful. My little girl is 3 and I bought them for her to use when she's a bit older, but she can actually use them at this age too. The blocks come nicely packaged with all the numbers packed in singles, tens, hundreds and thousands. There is a lovely drawstring bag to keep them in, and a comprehensive set of instructions. The blocks are a nice feeling plastic and they have ridges on the top, which correspond to which number they are. They also fit together to make 10, 100 or 1000 (eg. 3 and 7, 6 and 4). The booklet contains suggestions for games to play with the numbers and gives an idea of what age is it suitable for. I'm so pleased with this set, it's excellent quality and my little girl loves learning about numbers. This is a fantastic new educational toy. It has lovely well made bricks to use. It's great to play and learn together...it is really good at keeping the kids interested in numbers. Can even make our own games up to use. Really happy with it and I think it will be very popular. Very cleverly thought out maths game for children which will grow with them. Chunky, tactile tiles in nice bright colours which my 2 year old likes to stack and count, colour match and play snap with. My 5 year old is learning number bonds to 10 ("ten friends") and counting to 100 which these show in a very visual way. My 7 year old enjoys playing the suggested games with them as he thrives on competition. We race to put together a certain number or do a list of sums or times tables. He likes "boil the numbers". They've actually taught me a new way of thinking. The website has more ways to play on there too. At first my eldest was suspicious I was trying to make him "do work" but soon realised they are fun to play with as he really enjoys maths. My boy got this big toy box on his birthday. This is such an innovative toy that gives him a chance to learn and play. The material is very quality. I love how safe it is. The brick size is big enough so that my baby won't get choke by accident. My boy and I enjoy playing because it creates bond between us because I don't spend much time with him during the day. Would love to recommend it. This is an educational kids learning game/toy. I got this for my my son to try and help him with numbers a little and to have fun at the same time. I chose this product as I noticed it's been up.for.many awards and has won a good handful too which is always good when it comes to your kids learning. Well, you get 57 pieces in this pack and they are designed in a certain way to help with learning. There is so many different games and learning exercises to do and you can even make your own if you've got a creative mind. I'll list a few below to give you an idea.. There is 4 different colour types all having their own meaning..
Each piece has other features too..
On the top you have notches that count the first number. For example a yellow number 3 has 3 notches. A blue 600 will have 6 notches ect. On the sides of the pieces are a jigsaw like pattern which helps to add number which I'll explain also.. There is also a piece that sticks out on each block which is used for stacking pieces. Ok, some basic games and learning.. The jigsaw patterns - These are used to identify which piece and it's partner number add up to either 10, 100 or 1000. If you look at the pictures below you will see how this works with patterns not matching and the correct matches making the jigsaw match. Also, if your trying to add up to 10, 100 or 1000 you can put the pieces backside to backside. If you have a match then you will see 10 notches. If you are below your required number then you need to find the right piece that makes a whole line of notches or take away notches until you have the complete line. Adding different digit numbers can also become quite simple with the stacking feature. You could for example take the 1000+500+70+8. This might sound like a major task but with the stacking feature this becomes quite simple. I could sit here for hours explaining the uses and benefits but if you want my suggestion...if you want to help.i your child's development then I'd highly recommend this maths toy. It's a great way to spend time with your children and to help with their learning and have fun at the same time. We play bingo games and a couple out of the booklet which comes with it and we have a fantastic time. There is also some videos online of people showing different games and activities which can be done with this pack. Great buy. Thankyou. Me and my son love this. Highly recommended. These educational bricks are absolutely fantastic. My daughter, who has learning difficulties, was playing with them - and learning - within seconds of taking them out of the box. She had even made her own games up with them too which seemed to help her progression. They are very sturdily made, which is a bonus for children like her, and she even took them to school where everybody enjoyed playing with them. They come wth a handy carry bag meaning they can be kept safe when not in use too. The multitude of things you can do with these, mathematically or otherwise, really is only limited by your own imagination. The difference in confidence I have seen in my daughter since using these has really been 'night and day'. I can't thank Christina Blin enough for having the insight to produce something like this as I believe it really does fill a gap in the market. Beautifully designed with clever matching edges which encourage the correct answer through touch. I would do nothing else but recommend them to everyone for children with a young age, with little grasp of mathematics, or children like mine who find learning challenging. My boys LOVE these bricks!!! I am obsessed with toys that make them learn at the same time. The bright colors and the added counters on the side were a major plus!! They really thought of everything when it comes to making learning fun for kids. Wish I could give it more stars! Finally, I had a chance to play this stem toy with my niece. At the beginning, she didn't know how to play with this toy, since her math is really bad. I explained to her the rule of this game, and she started to like it. This toy helps her to learn the basic of math. We both had a fun time. My daughter is six years old and is in the first grade. I love the concept of the newmero bricks. We are able to play more than 1 game in which she is able to learn different concepts. I love that it is tangible and it helps her learn. My daughter is a hands on learner and the bricks have been the best thing I could've done for her. She is excited to play everyday. We play 20 minutes a day and I make sure to play another game with the bricks after she has the answers memorized. One of the things I found most interesting are the how the sides go together like puzzles. My six year old loves puzzles and the bricks have really caught her attention and interest. These bricks are such a clever way of illustrating math concepts to kids! The shape of the bricks, how they fit together to form "ten friends", and the bumps on the different sizes showing larger and smaller values are very intuitive and fun to play with. Newmero bricks take an abstract concept and turn it into a tactile, building block game that my kids really enjoy playing with. My three sons enjoyed playing a game like one I found on a YouTube video called "Who is largest". The videos are very helpful for getting the most out of these clever bricks. Perfect Educational Toy. suitable if you wish to spend some quality time with your kids from age of 3+. they are not a choking hazard, so they are suitable also for families where they have smaller children. To be honest I had to read to manual how to play with them. my two and a half year old has the same reaction like me when we opened the box: what am I looking at? When I studied the manual I think it is bit like a simple card game, which can be taken to higher levels with the blocks of different values and colours. This is such a good idea. Good for the little ones just to play with the bricks, to get familiar with numbers. Also comes handy when you are trying to help the older kids to understand math. I love that it comes with a storage bag, so they can put it away easily. It is well made and good value for the money. I am planing to buy another as a present for our friends. Love this product. It's so much fun for the whole family. My little girl favourite game is playing bingo with them. Highly recommend. The storage bag comes in really handy to. My 7 years old son was struggling with math so I bought newmero to help him. We spend the whole sunday playing and he learned very fast. It is amazing. Thank you. Great set of stem toys for my son. He definitely loved it! My boys LOVE these bricks!!! I am obsessed with toys that make them learn at the same time. The bright colors and the added counters on the side were a major plus!! They really thought of everything when it comes to making learning fun for kids. Wish I could give it more stars! I like that they can be connected to each other to make arithmetic problems and what not. Great for learning numbers and sequencing. Great for schools.